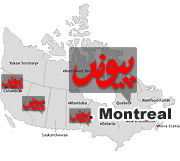 Paivand newspaper prints 60 pages (tabloid) in 10,000 copies once a week on Fridays in Vancouver and twice a month in Eastern Canada. Paivand is distributed free all across Greater Vancouver area as well as Victoria, Calgary and Seattle. Readership in Vancouver is estimated at over 40,000. Please contact us for the current Rates and Promotions. Paivand TV is a variety show with up to date coverage of all that happens in the Iranian community. Real Estate, Art & Culture, News, and more are showcased. This program airs on channel m (ch 8) every sunday from 12:00pm to 1:00pm. A second airing is shown on Monday from 7:00am to 8:00am. Radio Shabaneh aired once a week on Sunday nights for seven years. It was predominantly a one-hour phone-in talk show produced and hosted by Ramin Mahjouri. After taking a short break to restructure, Shabaneh packed with music, interviews and much more nowairs for two hours a week on Sunday nights from 7:00pm to 9:00pm.